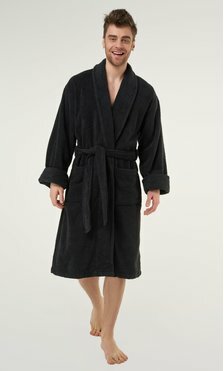 Welcome to Robemart, the number one destination for high quality men’s robes at deeply discounted prices. 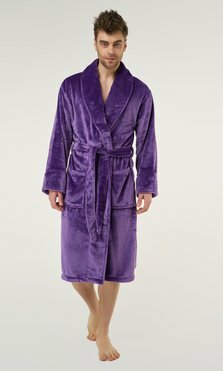 When you shop our huge collection of men’s robes, you’ll find a wide range of on-trend colors, lengths, and styles for every personal preference. 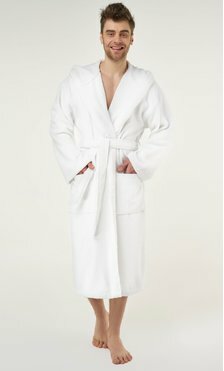 Whether it’s a luxe amenity for spas and resorts or for treating you and your loved ones to some at-home pampering, Robemart has the perfect men’s bathrobe for all your needs. Our deluxe robes are also ideal for hospitals, beauty clinics, or intimate, budget-friendly gifts for birthdays, wedding parties, and other special events. Our customers are always raving about the premium quality of Robemart robes and their surprisingly inexpensive prices. 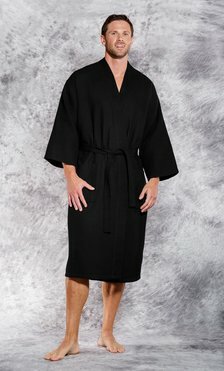 Made with top grade materials like plush cotton knits, micro-fleece, and ultra-soft 100% Turkish cotton, our men’s robes are the ultimate in luxury, style, and comfort. Choose from a variety of robes, including our bestselling waffle robes and a premium selection of terry velour robes in several styles and lengths. We also feature a selection of classic terry and micro-terry options for even more softness and water-absorbing action. 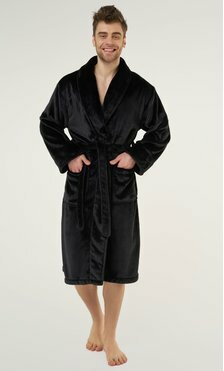 Get ready to experience head-to-toe softness when you wrap yourself in a men’s terry velour robe. 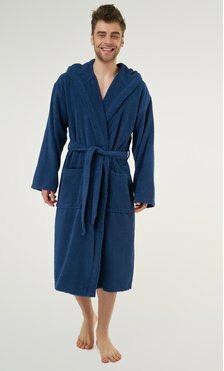 An ultra-functional unisex style, this 100% Turkish cotton bathrobe is made with brushed terry velour on the outside, which gives it a heavenly soft feel. 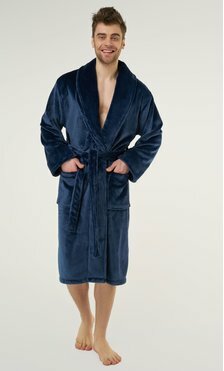 The inner terry cloth is lightweight and absorbent while it envelops your skin in luxurious softness.For added functionality, the men’s terry velour robe features two front pockets and a hanger loop for your convenience. 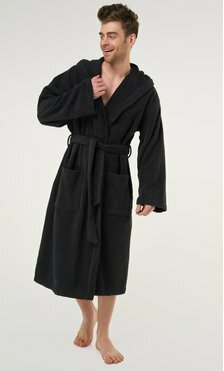 For even more warmth and coverage, the men’s hooded velour robe keeps your head warm and toasty; when you come out of the pool, spa, or bath, you’ll be dry within minutes. Designed with a shawl collar for a soft yet secure fit, this robe is a classic style for feeling relaxed and comfy, whether it’s on the go or in the comfort of home. This ultra-luxe bathrobe is a classic style that brings the comfort of home everywhere you go. Inspired by the traditional housecoat from the 19th century, our men’s terry cloth robe will make you feel like royalty with its sleek and stylish fit, with the shawl collar providing plenty of coverage and a baby-soft feel on the skin. For maximum coverage and warmth, the men’s terrycloth robe is also available with an extra large hood. Made with high quality 100% Turkish cotton, this elegant robe maintains its softness wash after wash. Another option for bath time luxury is our selection of micro-terry robes, which keep you feeling warm and cozy with plush, high quality fleece on the inside and out. Another unisex option is the men’s terry kimono robe, which is perfectly plush and lightweight for staying comfortable in any climate. Inspired by the traditional Japanese house garment, the flat neckline and wide sleeves provide a relaxed fit that’s wearable and effortlessly stylish. The men’s kimono robe also comes in a waffle-pattern style, the best option for durability and function. Available in knee length, or long, our flagship item is made with a blend of cotton knits that get softer with every wash, making the classic waffle robe a smart choice for five-star hotels, upscale spas, or as keepsakes for special occasions like birthdays or weddings. At Robemart, our extensive range of colors makes it easy to coordinate your robes with a special theme for your business or special event. Our selection of men’s robes also includes a premium waffle style made with 100% Turkish cotton for top-to-bottom coziness and luxury. Giving you the best in comfort and functionality, the special hatched pattern is both breathable and absorbent, while the clean lines of the flat collar give you a comfortable and stylish fit. You also have the option of personalizing your men’s bathrobe with initials or a hashtag that commemorates a special, once-in-a-lifetime event or your business’ logo. Available in vinyl printing or embroidery, your monogramming order will be shipped in three days. At Robemart, you can expect an easy and streamlined shopping experience, which includes our 100% satisfaction guarantee with hassle-free returns and free exchanges. We also offer shopping incentives like free shipping on orders of $150 or more and quantity discounts. 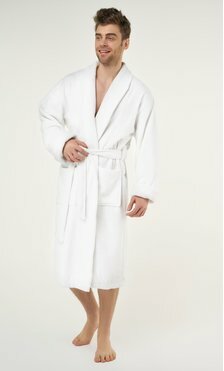 Shop our men’s robe collection today and experience the look and feel of luxury at everyday low prices.